We add a gentle reminder these are copyright images. You may link to them but not reproduce them. Pictures of the Wollaton area relating to the waggonway. The Causey Arch in County Durham is the oldest railway bridge in the world. It formed part of the Tanfield Waggonway. Built by Ralph Wood it was opened in the summer of 1725. Span = 105 ft. Deck height above the Burn = 80 ft. For 30 years the longest single span of any bridge in Britain. The bridge and adjacent "battery Site" (Embankment) are open to the public as a Country Park operated by Durham County Council. The DCC Causey page. A replica wooden bodied, and wooden wheeled, waggon on show at the Causey Arch Site. On the Site of the original alignment of the Tanfield Waggonway. Although not operational on this visit in 2009 the Beamish Museum have constructed a replica of the typical C18 wooden railled waggonway and horse gin (Colliery winding gear). Although waggonway development occured first in the midlands the first waggonway in the North East was an early one built in 1608. Development was extensive with the heyday of the horse operated, wooden railled waggonway occuring during the eighteenth century. 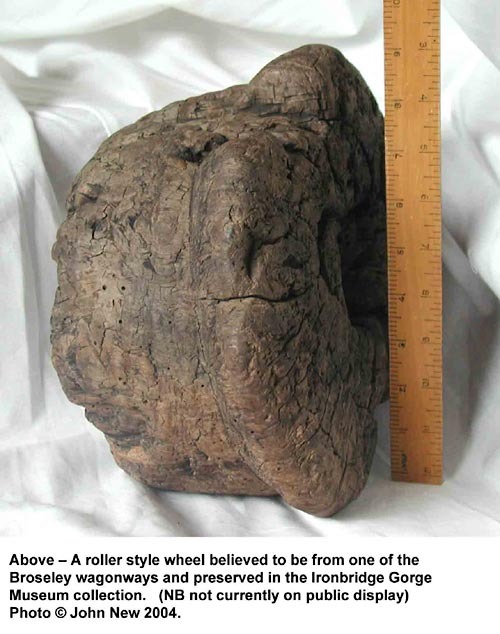 Wheel found at Broseley and currently believed to be from one of the waggonways of the area.